Time for an advanced media plugin? With 3.5-RC3, a few days before the final release, the capacity of organizing the order of attachments has been re-intorduced into the Media Uploader. Therefore everything written below is now obsolete! With the upcoming changes in the media uploader, it becomes clear that websites that have been using the capacities of the former media handling in order to build automated image galleries, will now need a custom plugin in order to maintain their functionality – most importantly: being able to manage the files attached to the post, changing their titles, their captions and their ordering. Why would a theme use automated image galleries? It’s a design principle: when a website is built with a custom design, it’s a good practice to let the designer decide about the page layout, not the end user. The designer decides about the structure, and about the positioning of picture galleries. The more layout options you hand out to the user, the more likely it is that the page structure becomes a mess. Ease of use: it’s a faster process, and one complicated decision that you take away from the user (“where to place the gallery in this article?”). With the automated gallery function, the user just adds images to the article, saves – job done, the images appear exactly where they are supposed to. In the left sidebar, in addition to “Upload Files” and “Media Library”, we also have “Attached Files” (that’s what was formerly labelled “Gallery” — but with the possibility of creating custom galleries, I think this new label is more clear). This section will allow us to change the order, edit the title, the caption etc, without inserting the result into the post. In the right sidebar, there is a Settings button, which allows you to define what input fields should be visible: Title, Caption, Description, Alt text, etc. This would allow you to change the sorting order of the attached files, just like in the old uploader. For a cleaner UI, we could replace the “ascending/descending” sorting button by a single one: “Invert Order“, that would just do what it says. The Delete button, that would allow to delete images. In order to prevent accidents, we could label it similarly to the “Danger Zone” in the GitHub interface… Update: this function has returned to the uploader with the RC1 release. How great! Basically, with this advanced plugin, we would get the best of two worlds: the new possibilities for inserting custom galleries if we want to. 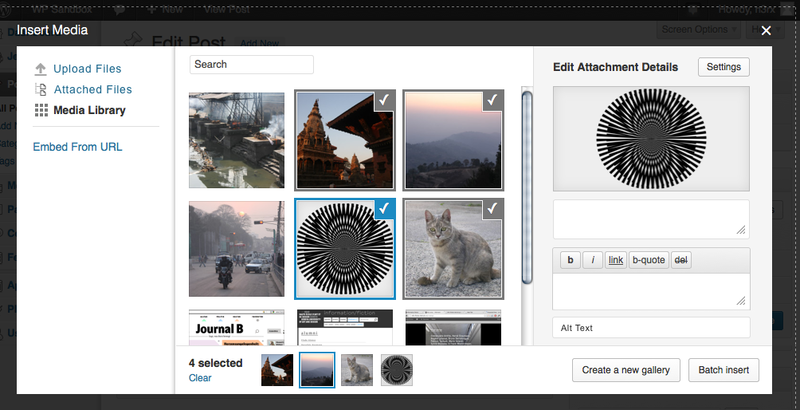 But also the efficient way of working with automated galleries. 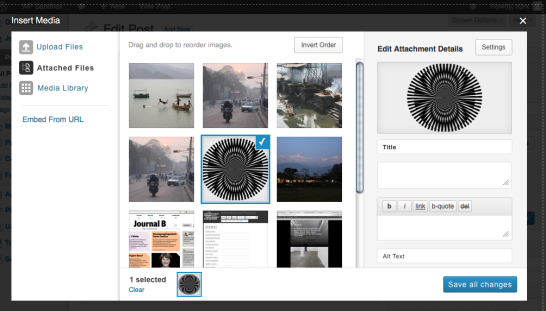 Actually, the excellent File Gallery plugin by Bruno Babić is a good workaround. Still, it would be a better user experience if the capacity of re-ordering and deleting images would be integrated in the media uploader. But having a decent interface for it is already a great start. With the current 3.5-RC1-22913 relase, the File Gallery plugin is broken… but it looks like this feature will be implemented in core (yes! ), following a discussion between Nacin and devinreams on the wordpress-dev IRC, there’s now a ticket for this.